← The Chupacabra Ate the Candelabra: A Cover Reveal! It’s Monday evening and more than 200 youngsters pour into the gym of Alisal High, a school located in the heart of one of the poorest neighborhoods in California’s central coast. The children, most dressed in the gold and black colors of the Gil Basketball Academy, are not high school students: they’re as young as four years old, some of them hardly big enough to pick up the basketballs. After the initial chaos, the children settle into a series of warm up exercises you can tell they know by heart: run forward, stop midway and run backward; run twisting your body; leap sideways and stop to touch the ground, repeat. From the edge of the gym, Coach Jose Gil watches the action and directs the children into their next moves. It’s a task that he can’t do alone – especially when he has to stop to provide direct instruction to kids who can’t seem to get a handle on the ball. So he relies on the assistance of other coaches, men and women who, like him, mostly offer their services on a volunteer basis. “Coaches” or “mentors” have been crucial for the development of mankind since time immemorial. Older or wiser men and women took young wards under their wings to teach them hunting and gathering edible plants, or to pass down traditions important for survival. The concept was crystallized in ancient Greece, when Mentor, a friend of King Odysseus, stayed behind to take care of the king’s son, Telemachus. The boy and Mentor developed a trusted friendship, one whose importance can be observed in centuries of literature and movies. Think Arthur and Merlin. Leonardo Da Vinci and Raphael Sanzio. Or Daniel and Mr. Miyagi. In places like the Alisal, where the population is 90 percent Latinx and 33 percent of the residents live in poverty, coaches and mentors are not a matter of legend, they’re a matter of survival. Parents who must work long hours in minimum wage jobs to put food on the table have to rely on the kindness of strangers to look after their broods. In the absence of trusted adults who can guide youngsters through the difficult passage through adolescence, some fall prey to the gangs. Latinxs are a young population. While more than 30 percent of Latinxs are under 18 years old, the same is true for 20 percent of whites. Nearly half of U.S. born Latinxs are younger than 18. At the same time, more than 23 percent of Latinxs live in poverty – second only to African Americans. Thirty-seven percent of all the children in the United States who live in poverty are Latinxs. For four of the last five years, Monterey County has led California in youth homicide rate. In 2013, 22 young people were slain in the county, also the fourth largest agricultural area in the Golden State. While parents are picking lettuce, their children are picking fights. This is why people like Jose Gil are vital – and luckily, there are a few. You can see them most afternoons in the soccer field, or in classrooms teaching painting, or dance, or music. They’re not just coaches: they’re role models, mentors, friends. They’re the glue of after-school programs, the difference between wholesome entertainment and life in the streets. One of the reasons why I wrote A Fighting Chance was to pay homage to these unsung heroes. Under the stern gaze of Coach, Miguel Ángel, the 17-year-old main character, trains to be a champion boxer. Not only is the sport keeping him away from gangs, but it’s also his ticket out of poverty. Coach’s importance to Miguel Ángel, like that of dozens of Coaches and mentors in the Alisal, cannot be overstated. “We have a huge responsibility to make the place we live in a better one,” Jose Gil muses. In his view, prospective coaches have to ask themselves: “Can you work and mold these young kids to make right choices and decisions in life? Are you a great enough example for others to follow? What is your passion or belief about life and the community you live in? Are you willing to invest time into changing the community one child at a time? Do you even think our community can be improved? And that’s how Coach Gil not only keeps hundreds of kids off the street, but inspires a new crop of coaches to do the same. Claudia Meléndez Salinas is an award-winning multi-media journalist now working for the Monterey County Herald, a daily newspaper in California’s Central Coast. She has nearly two decades of experience covering politics, education, and immigration both in Mexico and the United States. She holds a master’s in specialized journalism from the University of Southern California, and a bachelor’s in Latin American and Latino Studies from the University of California, Santa Cruz. Her journalistic work has been published in Mexico’s El Financiero and La Jornada; in Latina and El Andar magazines in the United States, and numerous newspapers. 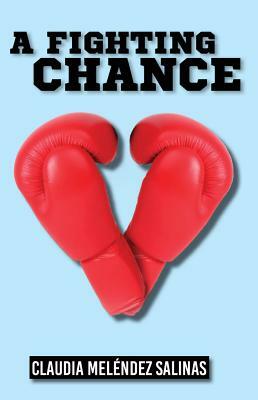 A Fighting Chance, Meléndez’s first book, is a young adult novel that narrates the struggles of a Mexican-American boy trying to stay away from gangs as he trains to become a champion boxer. She’s been named as one the Latino authors to watch in 2016 from LatinoStories.com.